This is a study guide to use with the McGraw Hill Wonders program. It is fifth grade. 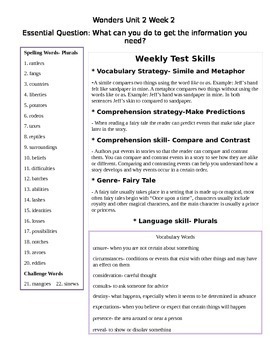 The study guide contains the essential question for the week, 20 weekly on level spelling words, 2 challenge words, reading vocabulary with definitions and strategy, language skill, reading comprehension strategy, comprehension skill, and genre for the week. *** I had the wrong language skill on this study guide. I have corrected it. Thanks.